Survivor: Ghost Island (2018) - 2nd place, five jury votes. Tied for win, but lost tiebreaker (5-5-0 [1-0]) in Episode 14, "It's Game Time, Kids" (Day 39). Ghost Island Ep. 1 IC: "Sled Zeppelin" - Helps haul the sled, works the puzzle, and Naviti wins! Ghost Island Ep. 2 RC/IC: "Coming Up for Air" - Swims and returns missed shots, as Naviti wins again. Ghost Island Ep. 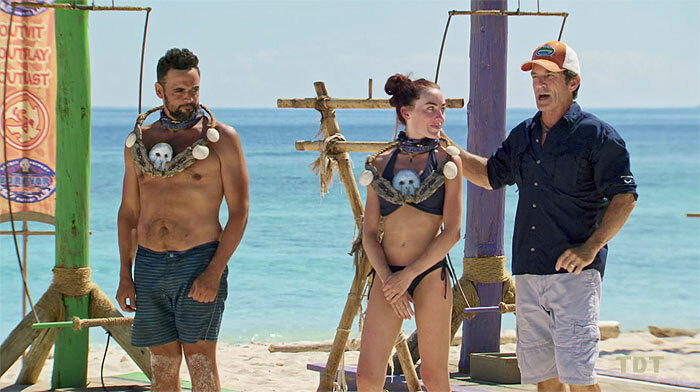 4 RC: "Water Slaughter" - Paired with James, loses a point to Sebastian/Bradley, but Naviti wins. Ghost Island Ep. 5 RC: "Rod Screw-It" - Helps dig out the lever, and Naviti wins again. Ghost Island Ep. 5 IC: "Hitch a Ride" - Turns the crank and helps solve the puzzle; Naviti wins again. Ghost Island Ep. 6 IC: "Sir Duke" - Now with new new Naviti, caller, directs the puzzle, and Naviti doesn't lose (2nd*/3). Ghost Island Ep. 7 RC: "Discy Business" - Sits out, as Naviti wins big (1st/3). Ghost Island Ep. 7 IC: "Cruel Sea" - Mysteriously forgets how to dive, and Naviti loses (3rd/3). Ghost Island Ep. 9 RC: "Gone Shootin'" - Gets two of the orange team's four hits, but orange team loses. Ghost Island Ep. 10 RC: "Caged Tigers" - Paddles the boat, works the puzzle, but the purple team loses. Ghost Island Ep. 13 RC: "Always on the Run" - Paired with Wendell, the purple pair wins! Ghost Island Ep. 8 IC: "Audio Slave" - Sixth person to drop out, on the transition to the final stage (8th/13). Ghost Island Ep. 10 IC: "Take the Reins" - Seventh person to drop out, within the first two minutes (5th/11). Ghost Island Ep. 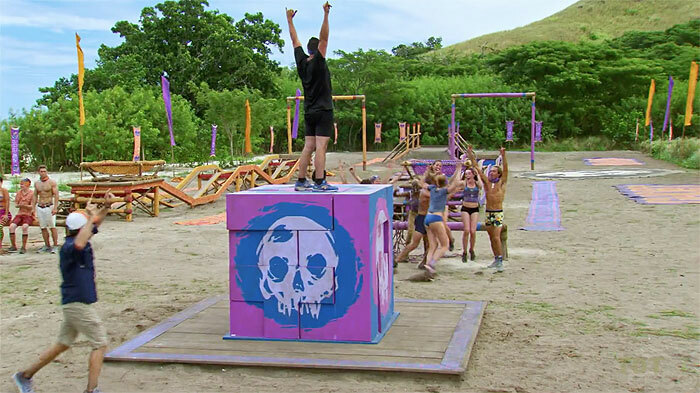 11 IC: "Crocodile Rock" - Outlasts the purple team and Wendell, and Dom wins! (1st/5). Ghost Island Ep. 12 RC: "A Quick Affair" - Tossing the final sandbag, but can't beat Sebastian (2nd/8). Ghost Island Ep. 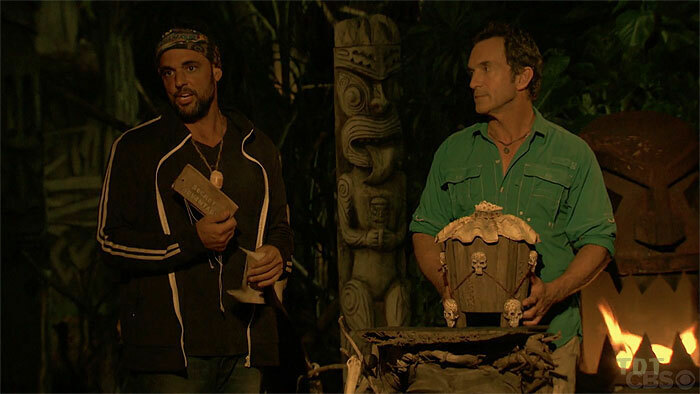 12 IC: "The Ball Drop" - Lasts until the final round, and Domenick wins! (1st/8). Ghost Island Ep. 13 IC: "Seven Bridges Road" - Working on the slide puzzle as Laurel wins (tie-3rd/7). Ghost Island Ep. 14 F6 IC: "Vin Skully" - Comes close to catching Wendell on the puzzle, but loses (2nd/6). Ghost Island Ep. 14 F5 IC: "Pyramid Scheme" - One of five working the puzzle as Wendell wins (tie-2nd/5). Ghost Island Ep. 14 F4 IC: "Stacked Up" - After Wendell's stack falls, carefully builds, and Dom wins! (1st/4). Ghost Island, Ep. 2: Finds Naviti's idol in the middle of Night 3; it's Andrea's from Caramoan. Ghost Island, Ep. 4: Willed the Legacy Advantage by Morgan when she's blindsided (Night 9). Ghost Island, Ep. 8: Plays the Legacy Advantage with 13 left, zero votes voided (Day 22). Ghost Island, Ep. 11: Finds David Wright's fake idol in a marked coconut (Day 28). Ghost Island, Ep. 14 (F6 vote): "Plays" David's fake idol before votes are read; Sebastian does not vote Dom (Day 36). Ghost Island, Ep. 14 (F5 vote): Plays Andrea's idol for himself, zero votes voided (Day 37). Ghost Island, Ep. 13: One vote, from Donathan. Ghost Island, Ep. 14 (F6 vote): One vote, from Donathan. Ghost Island, Ep. 14: Received five jury votes, from Chris Noble, Libby Vincek, Desiree Afuye, Jenna Bowman, and Michael Yerger, to tie for first with Wendell Holland, 5-5-0. Lost the tie-breaker vote, to take second. What's this in my bag? So happy to have Chris off my back! Reunited with Wendell. Also Chris. She's going against the family? It's David Wright's fake idol! You saw something in my bag, Donathan? Nah. Whoops, forgot to read the paperwork. Sorry, Seb. Erin Cebula at ET Canada (1/31/18): "Domenick Abbate Is Ready to Take a Chance on Survivor"
Dalton Ross at EW.com (2/2/18): "Meet Domenick in 60 Seconds"
Josh Wigler at The Hollywood Reporter (2/9/18): "Meet Domenick Abbate"
Gordon Holmes at XfinityTV.com (2/27/18): "Domenick - 'I'm Going to Exploit Anything and Everything I Can'"
Dalton Ross at EW.com (5/24/18): "Domenick Abbate on the brutality of the tie vote"
Gordon Holmes at XfinityTV.com (5/24/18): "Runner-Up Domenick - 'If I Could Do It Over Again, I'd Just Throw the Final Four Immunity'"
Mike Bloom at Parade.com (5/24/18): "Domenick Abbate Dominates, But Gets Damaged by Deadlock"
"Pet peeves: Fake people, small talk at parties, and judgmental people who are convinced they are better than me. What's your personal claim to fame? My greatest personal accomplishment came when my first daughter was born in 2008. Before her birth I was very overweight, smoked cigarettes, dabbled quite a bit at the craps table and would most likely be sitting down at the poker table on any given day. I recall a specific moment when my daughter was about a year old and she wanted me to take her outside on the swings. It was chilly that day so I had to dress warm. While putting on my shoes, I recall panting from being out of breath from the simple act of tying my own shoes. If you could have three things on the island, what would they be and why? A photo of my wife, a picture of my rugrats because they're awesome, and an antihistamine, which I will spike in somebody's drinking water if they are relentlessly annoying me and/or the group on the island. Which Survivor contestant are you most like? I know you are looking for one, but I am going to split this in three. Mostly Cirie, because I think she is masterfully empathetic with other players. She has an amazing ability to disable people. I hope I can do what she has done in the game. Second is Cochran. He wins in the emotional intelligence category that allows him to morph into whatever he needs to at the time. He also understands the importance of stroking other people's egos when he needs to. This is something I hope I am capable of doing. And finally Rob Mariano, for the simple fact that we both come from Italian families with a background in construction. But more importantly, he sees the game big picture which is critical and I hope I can maintain. Why do you think you'll "survive" Survivor? I grew up in a house with eight siblings. Lack of food, clothes, and showers are something I'm accustomed to. This game should be a walk in the park."